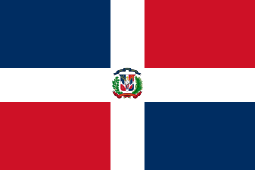 Dominican Republic - The Order of the Daughters of the King, Inc.
Barbara Dennis and Linda Smoak introduced The Order to the women in the Dominican Republic in 1998, and in 2000, charters for three chapters were presented by Tory Riihimaki and Barbara Ward. 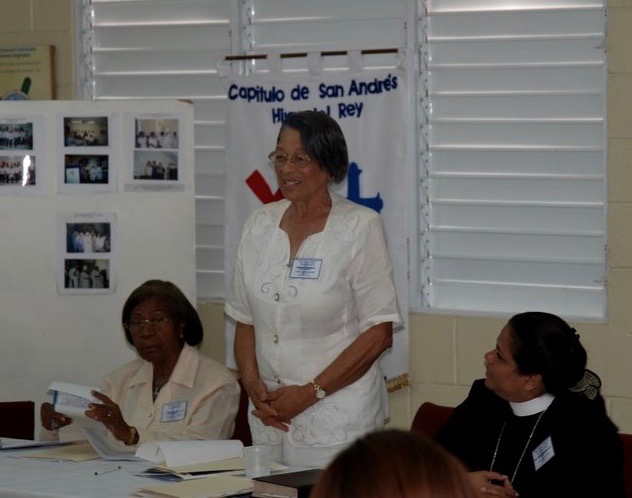 In 2007, the Daughters of the Dominican Republic formed their National Assembly and elected Srta. Virginia Norman as National President. Daughters from Province IV attended the first Assembly meeting, along with Province IV Chaplain, Bishop William Skilton. The first Assembly and election of officers was held on June 30, 2007 at the Diocesan Center in Santo Domingo. 63 of 69 Daughters on the island attended, along with five Province IV Daughters and Bishop Bill Skilton, Province IV Chaplain. La Anunciación Chapter was instituted at Iglesia la Anunciación, Santiago, on March 23, 2019 by the Rt. Rev. Moises Quezada. Pictured L-R: The Rev. P. Ramón A. Garcia, Ilonka Mendoza, Lourdes Maria Guzman, Nelly Brito, Bishop Quezada, Maria Lucrecia Fabian, Elena Maria Toribio, and Yanny D. Caraballo. On December 23, 2018 four new Daughters were admitted to San Esteban Chapter in San Pedro de Macoris. From L-R front are: Prudencia George, Chapter President; Hortensia Paredes, Vice President of the National Board; and new Daughters Juana Jackson, Martha Perez Guante, Marisol Mejia and Guncia Ramos. At the back are the Rev. Milquella Mendoza and Diocesan Bishop Moisés Quezada. The San Simon Chapter was instituted in Puerto Plata on November 11, 2018. From L-R are Amelia Vasquez, Luz Valdez, Celestina Rodriguez, DR President Berkys Herrera, The Rt. Rev. Moisés Quezada, The Rev. Raul Guailla, Edelmira Perez, and Irene Simons. On October 6, 2018 over 134 Daughters of the King of the Dominican Republic gathered at Santo Tomas Church, Villa Gautier, Llanos to celebrate the twelfth National Assembly. Special guests were: Marie Magdala Fleury, President of The Order in Haiti, and 8 Daughters from Haiti; The Rt. Rev. Moisés Quezada, Diocesan Bishop; The Rev. Diego Sabogal, Daughters of the King National Chaplain; and clergy and visitors from churches throughout the Dominican Republic. Eight Haiti Daughters were special guests. Haiti President Marie Magdala Fleury is second from left and Virginia Norman, Past President of the DR, is fourth from left. The theme of the Assembly was: Daughters of the King, Stewards of Creation, and the motto: Here I Am Lord, Send Me (Isaiah 6:8) Bishop Quezada encouraged the Daughters to care for creation and especially for women's lives, and to promote healing, reconciliation and evangelism in their communities. On the left are the three new Daughters admitted to Epifanía Chapter, Santo Domingo and on the right are the five Daughters admitted to San Matías Chapter, Santana, Bani. President Berkys and The Rt. Rev. Moisés Quezada are at the center. seen here with President Berkys. Four new Daughters were admitted to San Gabriel Chapter, Consuelo, San Pedro de Macoris. President Berkys is seen top right with Lolys Huerta and Margarita Fabela from Mexico (below), Vickie Stevens (Spanish translator) and Zoraida Maldonado from Puerto Rico. To view more information and stories, visit the Dominican Republic Archives page.